Clean, Comfortable and Family Friendly!! Our recently renovated 1st floor apartment is perfect for a small family! The great room is a comfortable space with plenty of seating. The fully equipped kitchen has all the amenities to cook any meal. Each bedroom has its own A/C unit and a queen bed. Outside there is a swing set for the kids to play on. Air conditioning is in the bedrooms only. We ask that our guests turn off the A/cs during the day. 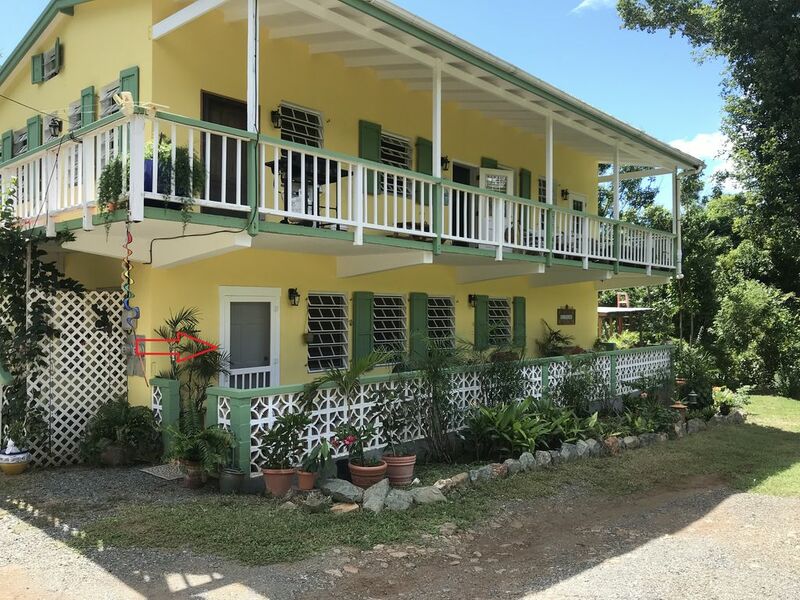 Great location, 5 min to Cruz bay, well stocked, very clean, great for families. Jessie was a wonderful host, we’ll be back. We loved our time here. Jessie was so kind, and they made sure we had everything we needed to enjoy our time in St. John. There is a full size kitchen with everything you need. Our daughter loved to play on the play set outside. There was an assortment of sunscreen available to use while we were there. The place is very conveniently located near town. We still enjoyed renting a Jeep to explore the island because there was so much to see. We really enjoyed the tacos and overall experience at Lime Out. You can rent kayaks at Hansen Bay to paddle out to the floating restaurant. Our daughter loved snorkeling, and we were all very happy to see the island rebounding after the recent hurricanes. There is a great sense of community here. Overall, highly recommended! We are so glad you had a nice time! Was overwhelmed with the attention to details and thoughtfulness towards supplying everything a guest could want. Very convenient location. Clean, updated, roomy, and Brian and Jessie were very friendly and accommodating. Couldn't ask for more and is a great place to bring your family. So what are you waiting for? Book it now!!! Thanks Michael! It was so nice to meet you! We really enjoyed our stay. The location was a short drive from Cruz Bay and less than a mile from a grocery store, so it was handy to stop in to pick up grocery items on the way to and from Cruz Bay. We had a wonderful stay. The house was clean, comfortable and well stocked. The owners were helpful and always available if we needed anything. I would highly recommend staying here. Easy check-in as they live upstairs. But you can’t hear anything, so no worries. Clean, nicely decorated, updated kitchen with all the supplies for cooking. Big enough for two couples. Jessie was quick to respond. Would stay again. Thanks!